It is so difficult to find the perfect perfume. How to find a perfume that does not smell too strong until everyone has to be at least 5 metres away to breathe? How to find a perfume that does not smell too light that it's a waste even to get it when there is no difference at all after 5 minutes of spraying? Does it have to smell the way I like it or better if i buy one that people around me think it smells nice? Does flowery, fresh, spicy suits me better? And you cannot choose what suits your sister/brother/best friend because it might not suit you as each one's skin has a different reaction to each perfume. But guess what? I think I found it. I have 3 perfumes, and I think they are more than enough for a person. I do not use them everyday, only when I feel like it. I try to use them more though, as it seems that a perfume also has an expiry date. Not sure what will happen to a perfume after it expires ... out of smell? Smell off? Turn sour? I bought this one at the airport, duty-free. A fresh fragance composed with delicate, light flowers combined with rose and Lotus. When flower meets water. A fresh aquatic with woody trail. The first look of it makes you think of a serene smell, light but gentle, almost like a Japanese-y feel that when you spray, Sakura blossoms will fall. For me, it is a bit strong for day wear, even though I bought the Eau de Toilette, I mostly use it for evening functions for more womanly smell. Please excuse me as the background of these photos are not the best and filled with boxes and Rainbow's toys on the floor. Below photo of the one I have at home, not sure why is the blacky ink on the bottle but it would not come out even after I tried to wipe it. It's not the best bottle in the world though, I actually do not like the quality of the bottle, but the shape is simple and nice. I included a promotional photo so you can see better. This perfume is given to me by Mummy. The tender fragrance to live in all year long. It sweeps over the senses, gentle as the ocean at dawn in waves of sea-kissed Apple Blossoms, Waterfruits, Sweet Peas and Camellias blushed with Honeysuckle and Sandalwood. Love the smell of the perfume. I wear it from time to time, I think it fits both in the day or night wear. 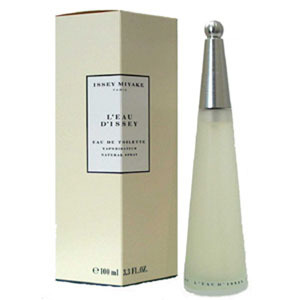 Quality of bottle is definitely better than the Issey Miyake's. A definite must try to see if it fits you. I bought mine at the airport (cos it's tax-free lah) , a big jumbo set. The original Be Delicious , the Green Apple. It has a clean, light and fresh, fruity smell. This perfume is the ideal everyday scent. This is the only fragrance I have that almost ALWAYS receive a compliment. People near me would ask me what perfume am i wearing, or just simply comment that I smell very nice. It is not powering, but people will smell if they stand very close to me or they give me a hug. I was always fine with not receiving compliments when wearing a perfume as long as they don't close their nose when they are near me. But I seriously get compliments everytime most of the time I meet somebody new with this fragrance. I guess green apples go well with me. Biggest advice I can give (and I think I am on of them who does it) - I tend to judge the smell by looking at the bottle and this is a mistake that everyone has to try to avoid. So, have you found your ultimate fragrance yet?